The digital marketing landscape is competitive enough as it is. It’s already difficult to compete against the endless stream of rival search results fighting for the same keywords on Google and Bing, but you also need to ensure that you don’t compete against yourself. Have no fear. 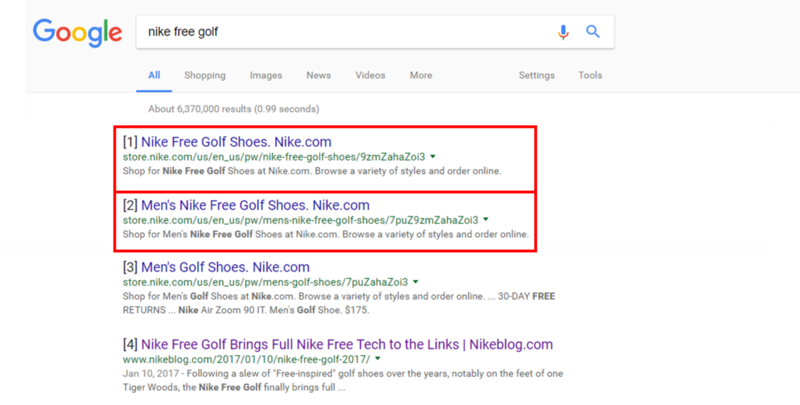 Here’s a guide to two reasons why you might be competing against yourself in the Google Search Engine Results Page (SERP) and what to do about it if you are. First, check out if you have webpages with duplicate content indexed by search engines. If you do, then they’re going to compete against each other on the SERP—and that’s bad news. All of the above will cause duplication headaches. If a user is searching for your specific page on Google and there are multiple URLs for the same exact thing, you’ll split your traffic, reduce conversions, and ultimately confuse users. To remedy this problem, it’s important to update your sitemap to make sure search engines don’t crawl your duplicate pages. When applicable, it’s also necessary to set up proper 301 redirects between these pages. Here is an example of duplicate content product view pages competing against each other. After checking for duplication in the SERP, you’ll want to look for duplicate meta data and content on your webpages. It’s super common for sites—especially large sites—to have identical meta data or content across product pages, blog posts, and so on. If you find duplicate metadata and content, your pages are competing against each other for the same target keywords. Don’t forget to check out our definitive guide to identifying duplicate content. For example, a company that sells “men’s activewear” and writes blog posts on “men’s activewear” is at risk of creating webpages that step on each other’s toes. To make sure you’re not competing for the same target keywords, think outside the box. If you’re an e-commerce site, make sure that your product pages target product-specific keywords while your blog posts target informational queries. By ensuring that each webpage has unique metadata and content, you’ll avoid duplication woes. Plus, you’ll increase the number of relevant search queries your website shows up for on Google and Bing by targeting different keywords and user search queries. This means higher traffic, higher brand awareness, and higher conversions. Here is an example of an online store competing against its blog and its corporate career sites for rank on their brand keyword. You want to compete with your competitors—not yourself. For tips on competitor campaigns, check out A Quick Guide to Competitor Campaigns for Technical Education.